Patients use many words to describe Dr. Christine Mroz, Medical Director of the Mroz Baier Breast Care Clinic. They comment on her kindness, empathy and compassion. They come to her during times of great emotional stress and appreciate her calm, reassuring bedside manner. Dr. Mroz takes the time to explain diagnoses and procedures to patients and their families and guides them into decision making. Dr. Mroz graduated from the State University of New, York in Genesco, New York and completed medical school at SUNY, Upstate Medical Center in Syracuse, New York. She was only the third woman to complete a surgical residency at the Mayo Graduate School of Medicine in Rochester, Minnesota. 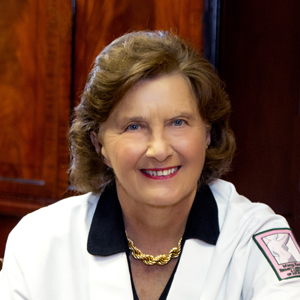 She has received numerous awards for her work as a breast surgeon, and currently acts as the Fellowship Director of the Mayo Clinic Imaging Studies at the Mroz Baier Breast Care Clinic. Away from her practice, Dr. Mroz enjoys spending time with her family and Minnie, her miniature pinscher. She is also dedicated to Bikram yoga and practices whenever time allows. She has always loved to read, and while she once planned on teaching English Literature, she is now content to curl up with a cup of tea and a good book. Fellowship Director of the Mayo Clinic Imaging Studies at the Mroz Baier Breast Care Clinic. Predicting the Need for Intraoperative Cholangiography after Cholecystectomy”, SG&O, 167:347, 1988 Christine T. Mroz, M.D., and Barbara Wilson-Relyea, M.A.